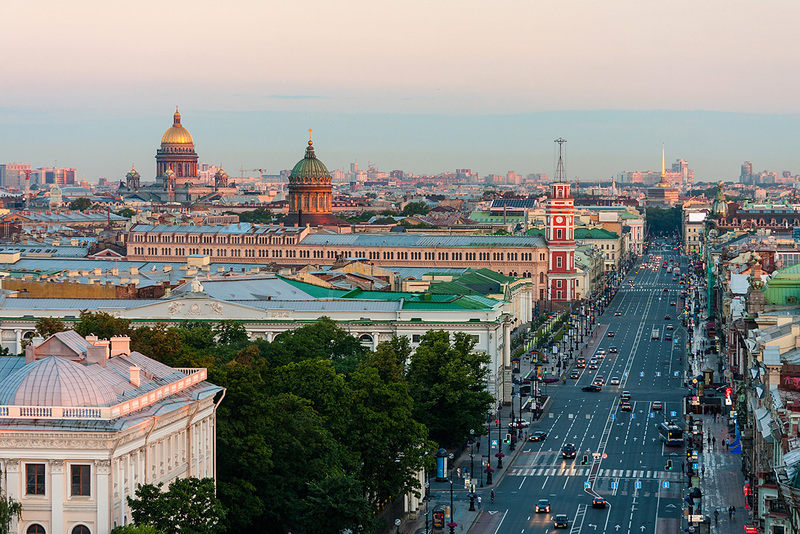 Probably everyone who has ever visited St. Petersburg has strolled along Nevsky Prospect – the heart of the city. If you want to feel the city's spirit, Nevsky is the right place. Nevsky Prospect, or just Nevsky, as locals call it, is undoubtedly St. Petersburg's main thoroughfare. Planned in the early 18th century as part of the main road to Moscow and Novgorod, Nevsky is today one of the city's main tourist destinations. Nevsky, however, has always been the central and most significant city street with numerous iconic and historical buildings. Who hasn’t heard of the impressive Kazan Cathedral, or the magnificent Church of the Savior on the Spilled Blood? There's much more to see, however, and so RBTH took a walk down the prospect to see lesser known landmarks that are very much worth your attention. In 1902, the Singer Sewing Machine Company purchased a property on the corner of Nevsky Prospect and Griboyedov Canal to build the company's main office and showroom in Russia. The building design was innovative and bold for St. Petersburg, for example using the pioneering (for that time) metal frame that in general made skyscrapers possible. At this time, the American sewing machine company was expanding rapidly both at home and abroad, and in fact, the Russian Empire was one of its largest markets. Singer spared no expense on its opulent headquarters in St. Petersburg, which was originally planned to be the tallest building on Nevsky, with at least 11 floors, which would violate zoning laws forbidding commercial construction higher than the Winter Palace (23.5 meters). Despite many protests from local forces of traditional architecture, Emperor Nicholas II gave permission to build the Singer Building in the Art Nouveau style, but with only seven floors. Architect Pavel Suzor capped the building with a glass and steel tower topped by a huge globe and the American coat of arms. Even today the Singer Building is one of Nevsky's most notable landmarks. In Soviet times, the building was known as Dom Knigi, or House of Books, and today it still houses the city's largest bookshop and a literary café. Meanwhile, the two upper flours are firmly in the 21st century, housing offices of Russia's leading social network, VKontakte. One last little quirky historical fact. In addition to its rich business and literary history, the Singer Building also housed the U.S. consulate and commercial section before and during the First World War. Erected in 1903, this marvelous Art Nouveau building was owned by the famous Russian merchants, the Eliseyev brothers. The huge emporium was luxurious for its time, with exquisite stained-glass windows and bronze interiors that the merchants hoped would attract customer interest. During the Soviet period, until 1990, the building was known as Gastronom No. 1. Today, walking down Nevsky Prospect, take a minute and stand before the Eliseyev Emporium, and you will be fascinated by the famous shop window with moving puppets from the Nutcracker fairytale. Inside is a famous confectionery with fabulous interiors reconstructed from the original Eliseyev brothers' design. What else can convey the atmosphere of picturesque St. Petersburg if not street artists? Every single day for decades they gather in front of St. Catherine's Roman Catholic Church, calling themselves ‘free artists.’ Some painters have been working on this place for 20 or even 40 years. Here you'll find many different artists and different art styles, and perhaps the best souvenir from St. Petersburg that you can take home is your portrait made by the hand of a local artist. When the era of cinema began over a century ago this movie theater was the most modern and opulent in Russia. Originally called Piccadilly Cinema, its opening in 1913 was a major event because of its luxury. In an epoch of silent movies, symphony orchestras played music to accompany the film's action, and the most famous people frequented the theater. Vladimir Nabokov even mentioned Piccadilly in his autobiography, Other Shores (1954). The current name, Aurora, was given in 1932 because the British name of Piccadilly didn’t make sense for the Soviet working class. Hence, the theater acquired the name of the legendary Russian naval cruiser that helped usher in Soviet power in 1917. Today, the theater retains its historical interior, and one can say that it's more than a movie theater; it's a genuine museum of cinema. Bridges are integral to St. Petersburg's identity, and Anichkov Bridge on Nevsky Prospect is one of the oldest in the city, spanning Fontanka River. Its beauty has been praised by writers as Pushkin, Dostoyevsky and Gogol. The Bridge is famous for its four bronze Horsemen sculptures designed by Peter Klodt. Today, Anichkov Bridge is also considered a monument to the Siege of Leningrad because it was badly damaged during the war and restorers have left traces of that damage from German shells as a reminder of those tragic years.